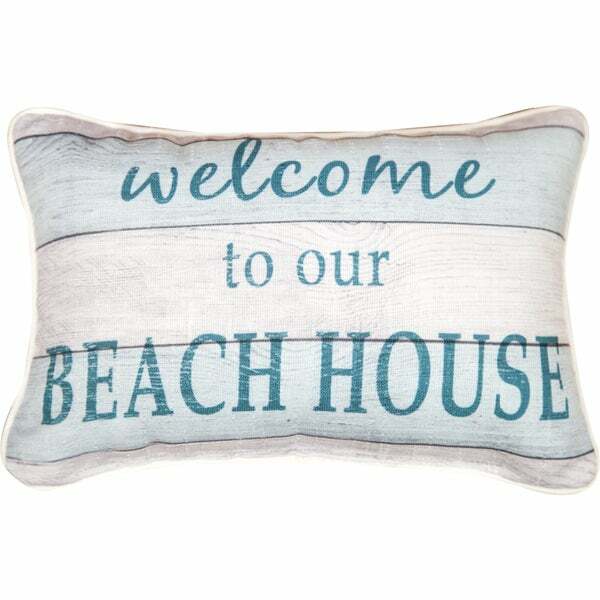 Love to have this simple but sweet pillow on our sofa to welcome our guests to our beach home. Not too big to take up space and just the right size to say welcome! Toss this charming throw pillow onto a chair or sofa for a welcoming look. Featuring a white and blue striped pattern that blends easily with casual decor, this rectangular pillow is perfect for decorating a sunroom or den. Very cute , but too tiny I’m not sure where to place it , maybe a dollhouse on the beach? I think I need to pay more attention to the demensions. But it is cute though very small. Quick delivery perfect condition. Quality American made pillow. Great craftsmanshift. This pillow is perfect for a small chair or as an addition to a grouping of other pillows. This pillow is so tiny that it's completely useless. My friend has a beach house and I knew he’d love it.